November is bringing Pets and Animals projects to you from the Auzz Trinklets and Crafts blog. I decided to pull out a stamp set I have had here for a few months and had not yet had a chance to use. I used Simon Says Stamp Cardstock in the colours Seaglass, Green Apple and Green Leaf for the sky, grass and tree foliage. The dies used were Lawn Fawn Stitched Tree Borders, Puffy Clouds Borders and Grassy Hillside Borders. The tree trunks were coloured with Copic Markers E17 and E 79. The cat was stamped in Altenew Inks, Paper Bag and Dark Chocolate from Altenew Modern Cats and the grass clumps were stamped from an older set, My Favorite Things Modern Blooms. 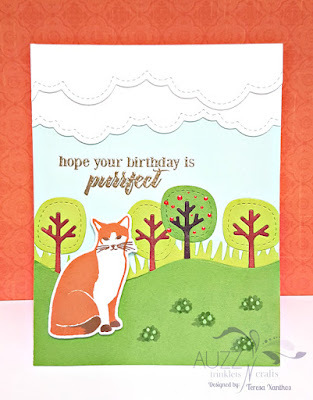 The sentiment was also from Altenew Modern Cats stamp set, stamped in Versamark Ink and twice embossed with Ranger Liquid Platinum Embossing Powder. I embellished the card using Ranger Liquid Pearls in Ruby Red and Tonic Studios Nuvo Drops in Simply White.